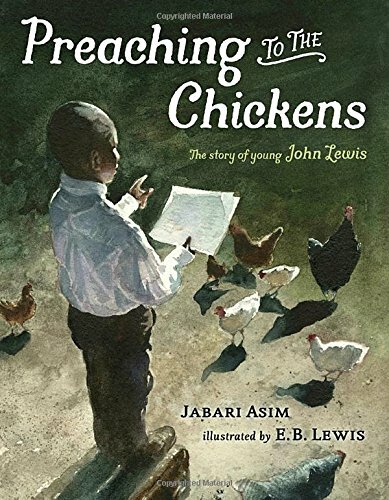 Summary: Growing up in Alabama, young John Lewis wanted to be a preacher. His mama always said, “Work hard and trust in God.” John loved going to church and found it easy to trust in God. Working hard took a little more effort. There was plenty of work to do on the farm where his family lived and grew cotton. John was put in charge of the chickens on the farm. After he had fed them and put fresh straw in their nests, he would pretend he was the preacher at church and that the chickens were his congregation. He even baptized them with water from a syrup can. When a man offered to trade with his family for one of John’s chickens, he convinced his family to trade other goods instead. Many years later, John would go on to speak before huge crowds and stand up for those who couldn’t speak for themselves, as a leader of the Civil Rights movement. An author’s note gives more information about John’s life as an adult. 32 pages; grades 1-5. Pros: An interesting slice-of-life look at a boy who rose from an impoverished childhood to do great things for others. The paintings by award winner E. B. Lewis capture life on the farm. Cons: Although the author’s note lists some of Lewis’s accomplishments, there’s not really enough biographical information for a full report on his life.